Acoustic night in the local Valley of the Mills. 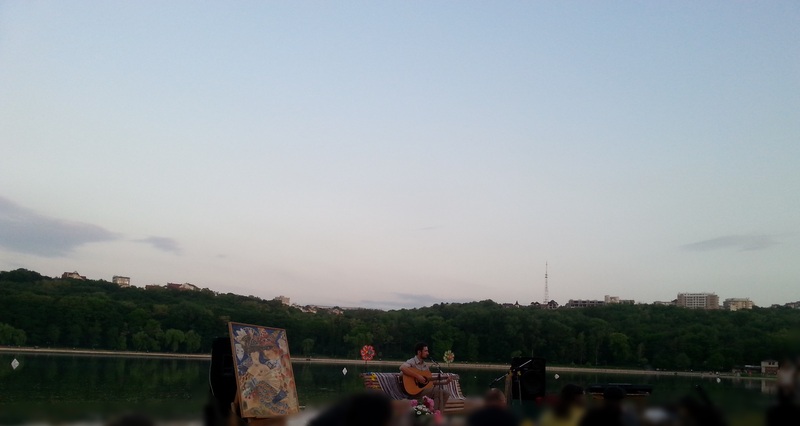 Yet another beautiful event that gathers beautiful people and that makes life in Chisinau wonderful in the summer. Simple decor, great view, soft sand on the artificial beach. The floor is open to anyone who wants to sing a few songs in front of the audience, with an instrument of choice : guitar, accordeon, sax, or whatever other instrument… or no instrument at all. Anyone who wants to tell a story, or a poem. This time, some songs were nicer than others, but there was this one poem that is truly one of the most emotional poems i have ever heard/read. It takes me back to every tear i shed for the unfulfilled, impossible or inappropriate loves… and for the ones that were not taken care of properly. (The poem is in russian : i did not find a translation for it, and if i had… it would probably ruin it. I will drown in your eyes…. May i? Я в глазах твоих утону. Можно? Ведь тонуть в глазах твоих – счастье. Подойду к обрыву – крутому! Буду падать – поймай! Успеешь? Только мне без тебя плохо! Я хочу быть с тобой, слышишь??? Очень долго – всю жизнь! Понимаешь? Не тяни своим взглядом в омут! Пусть другого ты любишь – ладно! Но меня хоть немножко помни! Даже если нельзя – буду! It is still not known for sure who the author of this amazingly touching poem is. Some sources say the poem is by Роберт Рождественский or by Эдуард Асадов. Others say it is by a moldavian poet. Either way, he probably did not care for recognition. He only cared for her. I will drown in your eyes, may i?